Kudos to all who helped with the shoe drive launched in December. We had an extraordinary outpouring of financial help in a brief amount of time in December. I purchased shoes as well as sent a generous offering to partnering ministry, His Eyes, that oversees my former ministry on the outskirts of Tegucigalpa, Honduras. With our gifts they can distribute shoes as well buy shoes in the capital. Thank you. Coincidentally, I happened to be in Honduras the same week that our shoes arrived. I went to Honduras last week. It was my first trip since I moved back to the US in 2014. I literally pinched myself a few times as I met friends at the airport upon arriving last Friday. Just to be back with such dear friends in a country that I love dearly was overwhelming. Our gifts will be distributed next week as school starts in the beginning of February. I spent a good deal of the time visiting my former ministry. It was a joy to be with the children as well as speaking with old and new staff there. If you follow me on Facebook some of the following information will be old news. However, it bears repeating, especially since some who donated do not follow my Facebook posts. The ministry is growing in size as well as the quality of services offered to the children. The new overseeing ministry, His Eyes, is in the process of completing a new children’s building. What a blessing it will be to have a new, larger space to help more children. In the meantime, the children’s present location has been given a facelift with renovated rooms and new paint. They have a ROOM OF COMPUTERS that have wifi! For such a poor and neglected slum area, that is a major achievement. Most homes do not have running water, just a bulb or two for lights, and no bathrooms. Yet, our building has wifi, pure water, indoor plumbing and as well as a safe place for young minds and bodies to grow. His Eyes Ministries started many years ago as a small eye clinic. Today, the clinic has two floors, offering services such as general medicine with two full-time doctors, a pharmacy, simple medical testing, a dentist office, an optometry department with a full time optometrist and one optometrist-in-training. The roads in this community barely qualify to be called roads in most cases, so the thousands of people in this crammed mountain area of shacks are grateful to have quality, afffordable medical care in their community. In the midst of turmoil in Honduras, I see hope. The country is still a place of tragic violence and poverty, yet I see much that speaks of hope. Thank you for being my audience for my writing though my years there, as well as partnering with Hondurans to make their lives better. I hope to find the time this week to share a few pictures from my recent trip as well as short excerpts about the lives of some of my friends from Honduras. The road was blocked by barricades. The troops tightly stood at attention the Avenida de Paz (Peace Avenue) in Tegucigalpa. I stopped abruptly. I had not seen the blockade until I was close to the soldiers, who stood in full combat gear brandishing semi-automatic weapons. Another day, another protest, some might say in a poor, violent nation. Today, the show of force was in response to credible threats of violence against the US Embassy in the capital of Honduras. A suitable show of force to threats against US interests was needed to allay concerns of big brother to the North. Nation rises against nation. Insurrections, wars, and now a return to barbarism in the Middle East dominates the international news. What’s our response? 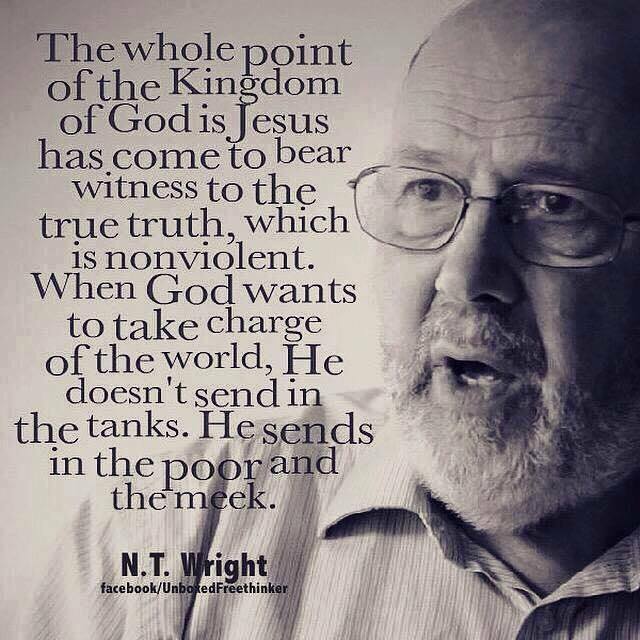 NT Wright, probably the foremost theologian of our times, espouses a theory of the Kingdom of God which on the surface often seems orthodox and unimpressive. Read his writings a bit closer. His Anglican voice argues that the Jesus of the Gospels, as is recorded, had radical views, indeed, so radical, that the society in which he lived condemned him to death.Jesus suffered a violent and unjust death. He did not resist but willingly gave up his life. He rose from the dead. Our whole Christian heritage rests on this truth. As his disciples, do we dare to follow the narrow way set forth by Jesus? Or do we just take up a call for more violence? I suppose it depends on which kingdom I want to see spread across the world: one of violence and retribution wrought by the powerful, or the upside kingdom of peace and reconciliation carried by the meek.